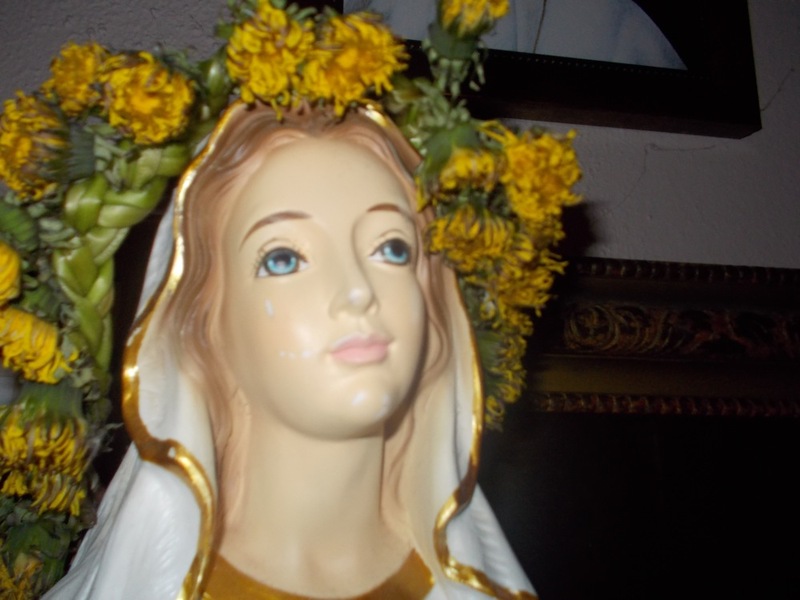 There are surely more beautiful crowns out there for the May crowning... and yet I'm not sure anyone could beat the level of excitement last night of our girls as Daddy lifted Sadie and she put our little crown of dandelions on our statue of Mary's head. The girls had been picking dandelions and had brought them to me where I was sitting with Patrick on a blanket in the shade. I began to braid them together, making a crown. Both girls tried on the crown and the excitement grew as I suggested we use it to crown the statue of Mary before our family rosary after dinner time. A few hours later it was already looking worse for wear. When I finally found my camera after the girls were in bed it had wilted a bit more. And yet even this morning there was an air of excitement about the crown that they had picked flowers to make.